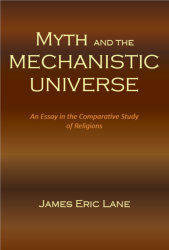 Title: Myth and the Mechanistic Universe: An Essay in the Comparative Study of Religions Author: James Eric Lane Imprint: The Davies Group, Publishers soft cover 398 pp. USD 30.00 ISBN 978-1934542286 November 2012 The author challenges the habitual and all too general attitude that makes us imagine a wall separating religion and science. By taking a fresh look at the historical evidence, Myth and the Mechanistic Universe makes the case that wherever the exact sciences have appeared, be it in classical Greece, ancient China, or the modern West, there is always an essential and logical relation between them and myth. Without falling into historical relativism, it places the myths and symbols that ground all cultures on an equal footing with those that underpin our modern scientific world. Prior to any scientific activity, people must first orient themselves; they do this by mythically enacting a world; only after having enacted a world mythically can they then begin their scientific analysis. The book’s purpose is to provide a serious, in-depth study that will allow students and other general readers to become aware of how religion relates to scientific practice in the world around us. More . . . Contents Preface Introduction Part One: Ancient Symbolic Forms Chapter One: Ancient Symbolic Forms Chapter Two: Myth and “Metaphysics” Chapter Three: The Secret of the State Chapter Four: The Ritual Enactment of the World Chapter Five: The Historiography of Astronomy in Ancient China Chapter Six: Myth and Astronomy in Ancient China Chapter Seven: The Christian Myth and Knowledge Part Two: Religious Forms and Physical Science in the Modern World Introduction Chapter Eight: The New Myth of Proportion, Numbers, and Precision Chapter Nine: Galileo’s Science of Local Motion Chapter Ten: The New Myth of Magic and Power Chapter Eleven: The Mechanistic Universe Chapter Twelve: Religious Forms and Physical Science Part Three: Religious Forms and History Chapter Thirteen: Myth and The Technicalist World Chapter Fourteen: From Cosmos to History Chapter Fifteen: Myth and the Mechanistic Universe Epilogue Notes Selected Bibliography About the Author Eric Lane received his PhD in the history of religions at UCLA. He has been teaching the history of religions for over thirty-five years, and studying the relation of religious symbols to the modern mathematical analysis of nature and human life.